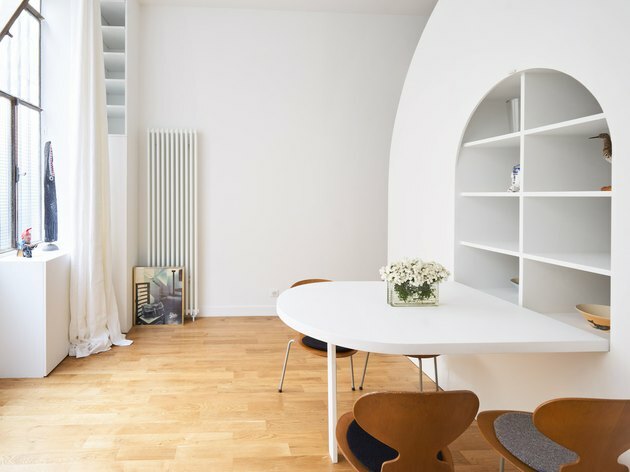 Some homes evolve over time, but a Parisian flat designed by architects Yves Pasquet, Cyril Gauthier, and Guillaume Aubry of Paris-based firm Freaks Architecture evolves in seconds. 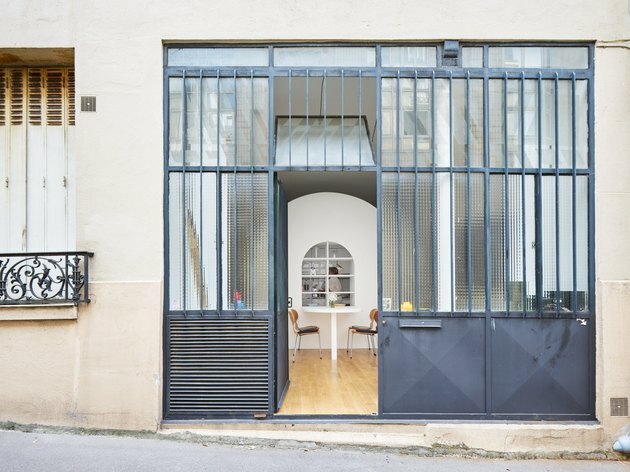 The owners hired the firm to transform their home, a former workshop in the 13th arrondissement, into a flexible living space. 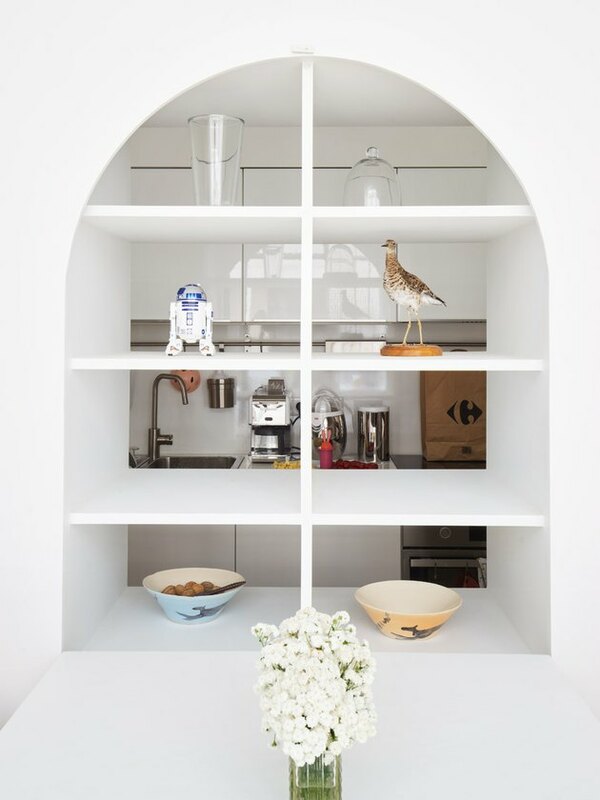 Nicknamed La Tournette (the turntable), the home is centered around a large cupboard, which serves as a room divider and includes storage and a folding table. The piece can be moved depending on the owners' needs, creating a flexible space. What the space lacked in square footage (it measures just over 320-square-feet), it made up for in ceiling height and natural light. The architects took advantage of the soaring ceilings and installed a sleeping loft above the kitchen and bathroom. The finished home is bright, modern, and ready to change at a moment's notice. The exterior is a remnant of the home's previous life as a workshop. The front windows let plenty of light into the petite apartment. The centerpiece of the entire space is the movable storage unit, which allows the owners to reconfigure the space in seconds. A folding table is built into the central storage unit. 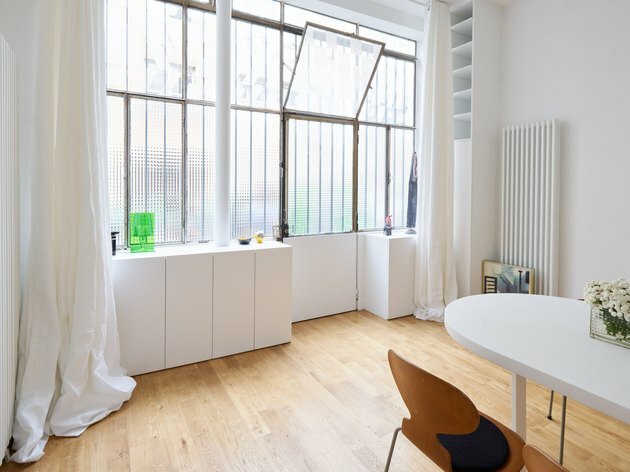 Crisp white was used throughout the space, adding to the clean, uncluttered feel. More storage lines the front of the apartment. Drapery panels provide privacy and block out the sights and sounds of the bustling street outside. Unfolding the table creates a view into the kitchen and lets more light pass through to the rear of the apartment. All of the kitchen essentials are installed along the back wall. 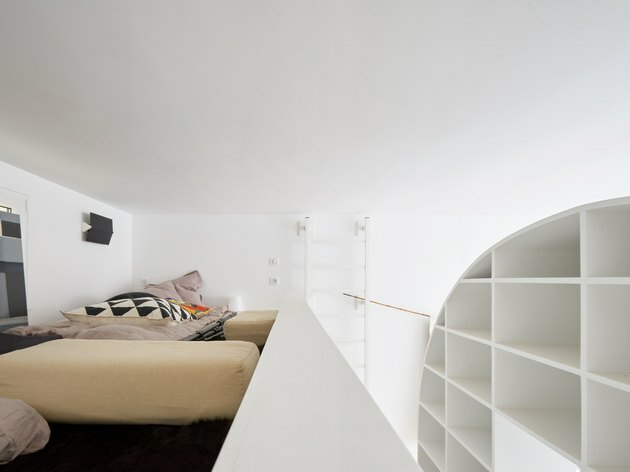 The simple sleeping loft has space for two beds and can be reached by a ladder located next to the kitchen. 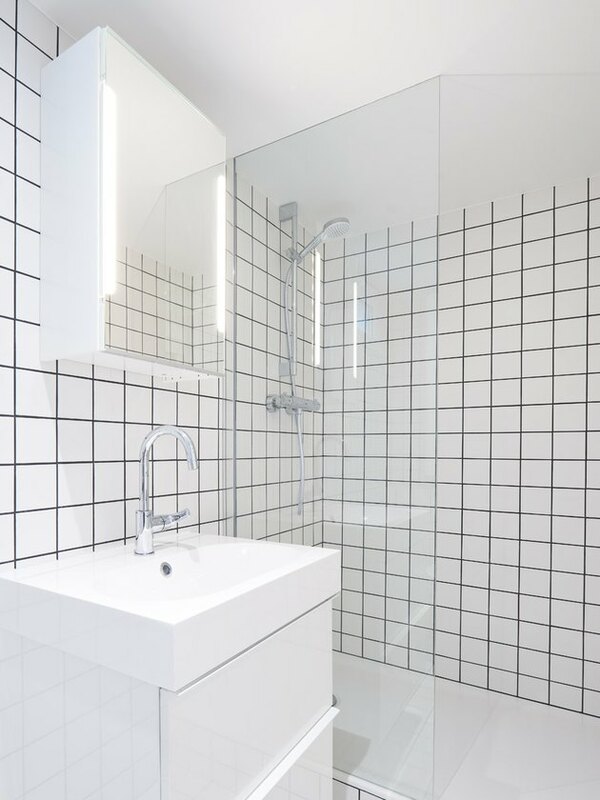 White square tiles and black grout create a graphic statement in the bathroom. The glass shower divider helps the tiny bathroom feel larger.